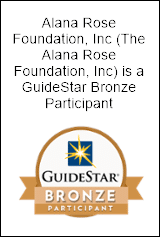 We would like to personally thank you for your previous donation to Alana Rose Foundation, Inc. We have been very busy this past year working to keep families strong and together while in the hospital, and because of your help, we have done great work in honor of our sweet angel Alana. Wait unitl you hear our accomplishments! We are so proud of our success this year and will continue to do even better next year; However, as you can see, itʼs only possible with your help! These families that need our help must fall under our qualifications, the children must be under 18 years old, and the financial burden must be verified and documented by their Social Worker on the intake. We work hard to make sure each family is qualified with a terminal or life threatening illness. Our assistance is mostly given to help families with electric bills, rent, car payments, and visa gift cards to help with transportation and daily needs while hospitalized. If you wish to keep Alanaʼs legacy alive, please mail back a donation to our P.O box listed below, or visit thealanarosefoundation.org/donations to be part of a miracle!